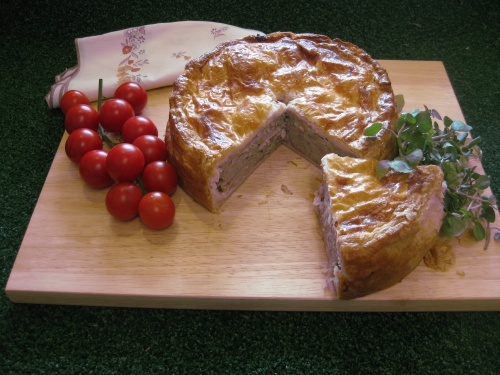 This tasty pie is good either for a buffet or for an outdoor lunch or picnic. It can be served hot but it is best served cold on the day it is made. You will need a 20cm/8” spring form tin or a deep cake tin with a loose base. I used a spring form tin from Lakeland. Filling: chop the onion and apple finely. Grease the tin. Heat the oven to Gas 6/400C. If using a block of pastry roll out 2/3 to line the tin, taking care not to form creases. Mix the sausage meat, the apple, onion and thyme. Cover the pastry base with slices of ham, cutting them to shape and spreading on a little mustard. Cover with half the sausage mixture then repeat with ham slices and mustard. Spread the remaining sausage meat evenly on top. Roll out the remaining pastry to a circle to form a lid. Brush the top side edges with beaten egg and press the lid neatly on to them. Brush with egg and make a hole in the centre. Place on a baking tray and bake for 10 minutes then lower the heat to Gas 5/190C for a further 30-40 minutes. If using a spring form tin, remove the sides 10-15 minutes before the end of the baking time and brush the pastry sides with egg, returning the pie to the oven. Cool on a cooling rack and leave until cold before slicing.